Your guests have wined, dined and danced for many celebrations, the function has run out of ideas. Roll on the candy cart! Guests of all ages will flock to it, giggling away as they fill their sweet bags with treats. And when you ask anybody the next day what they remember the most (besides the beautiful bride! ), we guarantee it will be the candy cart! Candy carts are the hottest new trend for wedding and parties. 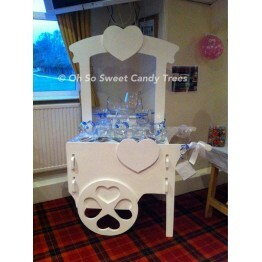 We can create you a dazzling sweetie buffet that will offer your guests a truly unique 'kid in a sweet shop' experience. Our candy carts are not the normal traditional style, instead we have custom made heart themed candy carts with a new contemporary feel. They are unique and really catch the eye in any function room. We can even use LED lighting if the cart is in a dark area to enhance the look of it. We decorate the candy carts in any colour scheme and have various decorations for weddings, christenings & birthdays such as shabby chic buntings and white rose garlands. Candy Carts are not only for weddings, they are proving a huge hit for corporate events, Birthday Parties, Christenings and more. Please visit us in store to discuss the various packages we can offer you and you will get the chance to see our beautiful carts dressed up displayed in store. 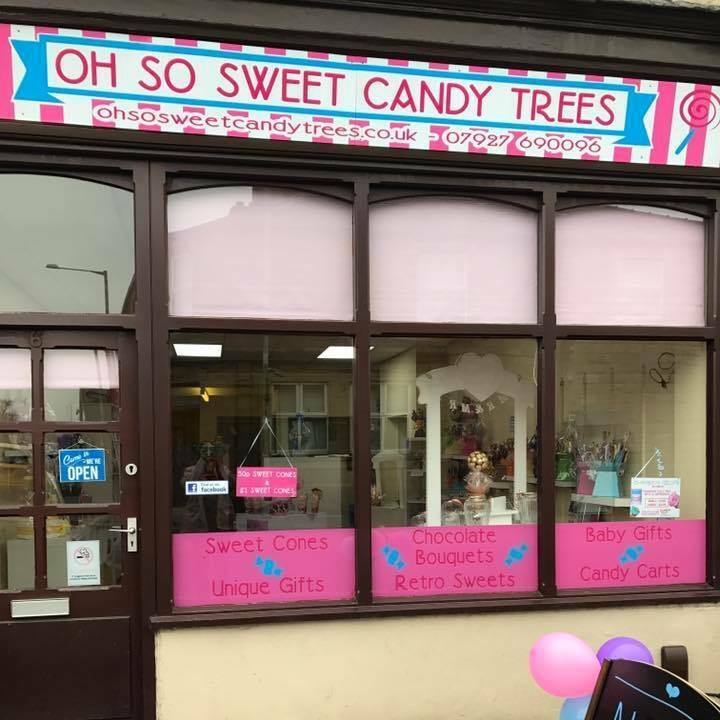 We are located on Arch Street, Burnley, Lancashire, BB11 1BQ (Just off the big roundabout before Burnley College just under the arch railway bridge) We are Open 10am – 3pm weekdays & 10am - 1pm Saturdays. The remaining balance is due 1 week before the event and the refundable deposit of £30-£50 will be refunded back to you on collection of the cart and all its contents (glassware, scoops, decoration) if there are any items missing or broken (missing scoops, or damage to a piece of glassware) we will have to deduct the repair or replacement cost from your deposit. We can discuss all this with you at the time of booking and this policy will be given to you in writing on booking of your cart to agree to before going ahead. We have a right to change this policy at any time. For Weddings, Christenings, Mehndi Celebrations, Corporate Events etc prices start from £100 this is for a full day hire. We can cater from 70 to 200 guests, get in touch for a quick quote/price list or for any quieries. You can purchase the 'Kid's Candy Cart Package' & the 'Candy Cart With No Sweets Package' through the website, please confirm the venue date and times in the comments box before checkout, and then we will book it in & do the rest :) but for all other events please get in touch for a tailored quote. 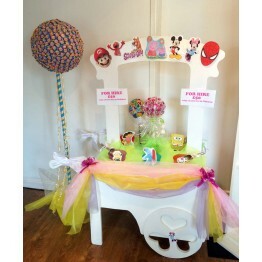 D.I.Y Candy Cart Hire - D.I.Y Kid's Party Package​ The Kids Mini Cart is at a lower height size t..
Candy Cart Hire (without sweets) Included in this package: • Candy Cart Hire for a daytime cel..